The What: VITEC (Stand 14-M200) will showcase the latest capabilities of its EZ TV IPTV and Digital Signage Platform at ISE 2019. The What Else: VITEC's EZ TV IPTV and Digital Signage Platform is engineered for the ever-changing video, marketing, and sales requirements of today's sports venues as well as for the secure dissemination and content management of full-motion video streams and offline files for enterprise and mission-critical applications and government agencies. Designed to integrate with any IT environment and run on all types of networks—LAN, WAN, and wireless—EZ TV can be rapidly deployed for nearly any size project. With centralized creation, distribution, and monitoring of live and on-demand content and digital signage, the platform streamlines the process of linear and non-linear workflows. Its network-agnostic, modular architecture allows organizations to upgrade legacy systems or deploy a turnkey IPTV and signage solution for a new build at a fraction of the cost of traditional digital signage solutions, according to the company. For sports and entertainment facilities, EZ TV can offer advanced fan experiences while reducing CAPEX and OPEX often associated with legacy solutions. "We're seeing more outdated RF-based facilities being transformed by EZ TV," said Bruno Teissier, international sales and marketing director, VITEC. "Not only is the platform bringing them into the IPTV world, it's also improving OPEX, supporting HD and even 4K as they explore future capabilities, and allowing users and fans to access digital media from any screen—TVs, PCs, or mobile devices—and have the video-on-demand experience they crave. ISE 2019 is the perfect opportunity for VITEC to discuss with attendees how EZ TV's latest innovations can simplify deployment and management of projects involving IPTV, digital signage, and video wall content." The platform's video wall capability is designed to simplify deployment and management of projects. VITEC's video wall processors are 100-percent hardware-based, feature low-latency native playback of IPTV streams up to 4K, and support interactive content and imagery transformations. More than 50 displays can be managed from a single processor, including nonstandard layouts and resolutions of TVs and LED walls. With the rapid adoption of video streaming and recording workflows, organizations increasingly face challenges related to storing, searching, and playing back valuable assets effectively. EZ TV's new Media Library module enables users to find, tag, edit, organize, store, search, and share media files quickly. Featuring a user-intuitive HTML5 interface, its tools streamline media processes from live streaming to recording, archiving, and collaboration, allowing users to manage a full digital video experience across an entire venue. 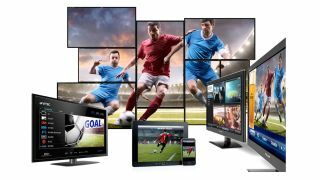 The Bottom Line: Designed for sports and entertainment venues, enterprise, government, and military agencies in Europe and the U.S., EZ TV's feature set enables organizations to centrally manage and stream HD, low-latency, in-house feeds and TV channels, as well as create eye-catching digital signage and video walls for distribution to any display through a facility.